Looking for Package Deals to Sandhills? We have those too! Sandhills Getaway - 2 Bedroom Condo and 3 Great Tracks starting at $111 per person, per day! Get Ready for a Great Sandhills Golf Getaway Staying at the Talamore Golf Resort and Playing 3 Great Tracks Starting at $111 per Person, per Day. Price based on 4 golfers per 2-bedroom condo. Extra nights available. Other courses available. Contact a Sandhills Vacation Specialist for first-hand knowledge of the area & package details, or to get a customized trip itinerary! This area's Scottish Heritage and turn of the century villages makes our golf culture come alive. 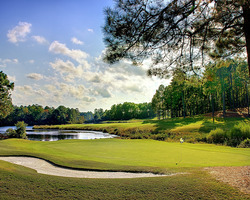 The Sandhills extends to include many other communities also known for its beautiful landscapes and challenging golf. Located halfway between New York and Florida, and halfway between Appalachian Mountain and the Atlantic Ocean, the Sandhills is without a doubt one of the most scenic and enjoyable destinations in the world. The region's courses are as beautiful as they are challenging. Well-manicured greens meander through stands of stately pines and magnolias and along sparkling lakes. And the region's four distinct, yet mild, seasons permit year-round play. The Mid Pines course remains exactly as Donald Ross numbered and routed the course in 1921. Impeccably manicured to modern standards, Mid Pines is a classic gem, a rarity among Ross's masterpieces because it is exactly as he crafted it more than 88 years ago. 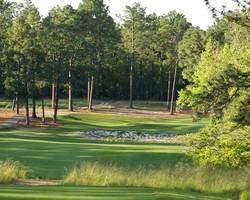 Even so, Mid Pines has played host to many national competitions, including a Senior Women's Amateur Championship. Many people have characterized the course as "pure Donald Ross" because of how it fits the land where it was built. It has few forced carries, artificial or contrived holes. It's been said that Mid Pines was never conceived as a daunting task to the finest players competing under championship conditions...Mid Pines was intended simply as a fun course with adequate challenge for members and guests of a private club and resort. Located just minutes from the historic village of Pinehurst, North Carolina, the Mid South Club is one of the Carolinas most attractive private residential golf communities. Five hundred forty five acres of longleaf pine forests, lakes and gently rolling hillsides provide a backdrop for a place of beauty and serenity. The Mid South Club Arnold Palmer signature golf course offers it's members a challenging yet enjoyable championship layout on which to test their skills. We invite you to explore all that the Mid South Club and the Pinehurst area have to offer. One of our two Silver Medal Resorts as awarded by GOLF Magazine, Pine Needles offers character, warmth and comfort. Built in the 1950's and nestled among towering longleaf pines, our chalet style lodges provide exceptional comfort with recently renovated rooms and all of the luxuries of home. Balconies and terraces allow you to gaze upon the championship course, a Donald Ross gem that was recently ranked #4 in North Carolina. After Pine Needles underwent an important restoration project from the watchful eye of Ross aficionado, John Fought. The greens were rebuilt, bunkers were dug out and fresh sand was installed. Contours and dimensions of greens were restored to their original forms as shown by a series of vintage aerial photos of the course, returning the course to its original glory. 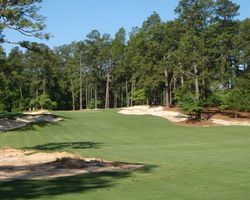 Following the restoration, the Pine Needles course measures more than 7,000 yards in length with some holes having been "stretched" to return the shot values that Donald Ross intended for this course. Fairway bunkers are now placed so that they serve as the kind of hazard that Ross intended for the tees.